I have never been one… to speculate about what equipment may or may not be forthcoming from any manufacturers. However, I really think that Nikon have stolen a bit of a march on Canon with their latest Nikon D3. There are several features that I really like, and wish that Canon had (or will) include in the next generation of the EOS1D. First and foremost the one thing that I have disliked since the EOS1D MkII was the addition of the SD card slot, as well as the CF card. 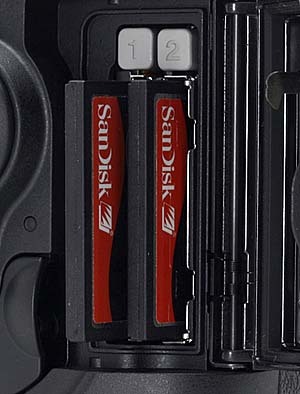 The Nikon solution is far more elegant, using dual CF cards. Whilst I realise that the SD card standard will enable the SD card slot to be used for far more things than the current CF Card format will permit, it is a pain in the arse when it comes to it’s primary function, taking pictures. The main downside is that there are no Firewire multi card readers, and when you remove the CF card the camera then switches to the SD card, it doesn’t swap back when you re-insert the CF card. Several other features that the EOS1D mkIV must have, to enable Canon to continue the market dominance in the News and Sports market place (in my opinion) is Full Frame, with at least the same performance of the EOS1D mkIII. Higher ISO performance that Nikon have achieved with the D3 or 25,600 ISO, and preferably Low ISO support down to 25 ISO. Realistically the camera doesn’t need to produce image file sizes like the EOS1Ds mkII, but something of the order of 16 megapixels would be nice.